The new result came out of research into possible interactions of lava flows and floods of water in the Elysium volcanic province of Mars. "Athabasca Valles has a very interesting history," Ryan says. "There's an extensive literature on the area, as well as an intriguing combination of seemingly fluvial and volcanic features." He notes, "The coils become noticeable in the full-resolution HiRISE image only when you really zoom in. They also tend to blend in with the rest of the light-gray terrain -- that is, until you stretch the contrast a bit. As Ryan explains, "The coils form on flows where there's a shear stress -- where flows move past each other at different speeds or in different directions. Pieces of rubbery and plastic lava crust can either be peeled away and physically coiled up -- or wrinkles in the lava's thin crust can be twisted around." "Since the surface of active lava lakes, such as those on Hawaii, can have crustal activity like spreading centers do, it's conceivable that lava coils may form there in a similar way, but at a smaller scale." 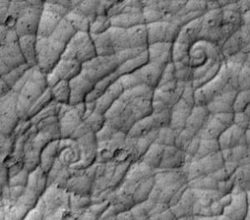 The size of Martian lava coils came as a surprise. "On Mars the largest lava coil is 30 meters across -- that's 100 feet. That's bigger than any known lava coils on Earth," he says. Ryan and Christensen's work has inventoried nearly 200 lava coils in the Cerberus Palus region alone.